Dog Activity Trail at Thorndon Country Park01277 211250work Town TrailThorndon Country Park Dog Activity Trail offers dogs and their owners the chance to interact and get fit at the same time. The trail is made up of 10 stand-alone obstacles, taking inspiration from those used in dog agility competitions. It's a great way to get a taster of what agility is like. It is approximately 500 metres in length, is free to use and it can be started at either end. The two starting points can be seen from Thorndon Park South Cafe and the trail runs around the edge of the field. The course includes hoops, hurdles, long jumps, weaves, log walks, tunnels, an A frame and a table top, all placed 50m apart. Most obstacles are in two sizes to accommodate dogs of all types and abilities. Built by volunteers from the Thorndon Guardians, the Thorndon Park Dog Activity Trail is the third to be created under the scheme - an initiative created collaboratively by the Forestry Commission, the Kennel Club and dog agility experts. 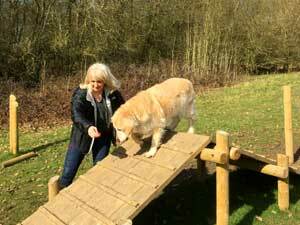 The main ethos of the trail is to get the dogs and their owners working together and being healthy. We promote responsible dog ownership, so please ensure you pick up after your dogs, use the course safely and don't let puppies jump over the obstacles as their bodies are still developing. More information about the use of the dog activity trail can be found at the site. Thorndon Country Park Dog Activity Trail offers dogs and their owners the chance to interact and get fit at the same time. The trail is made up of 10 stand-alone obstacles, taking inspiration from those used in dog agility competitions. It's a great way to get a taster of what agility is like.